If you ever wanted to go see a cross event, you should show up for this one. No, I’m not talking about cross dressing. Be there, it’ll be fun, look for us at our booth. Or wandering around with a beer. 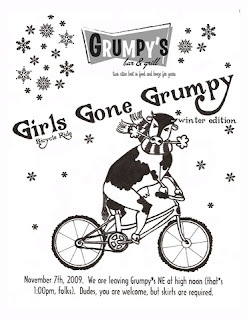 Then there is the Girls Gone Grumpy Winter ride (minus the snow). If your not into the racing and would rather ride around to some bars and chill with the ladies then this is your event. Oh, and if your a dude and want to do this, you gotta sport a skirt. Rules are rules.